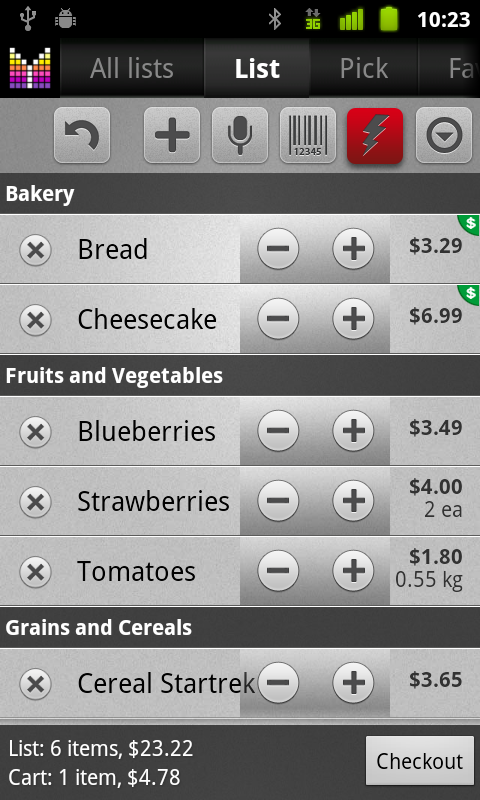 I have Mighty Grocery for both my phone and my kindle fire. 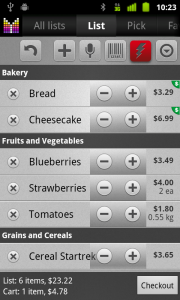 I’d like to be able to sync my kindle and get the shopping lists from the phone. Is this even possible? Jan, thanks for your question. 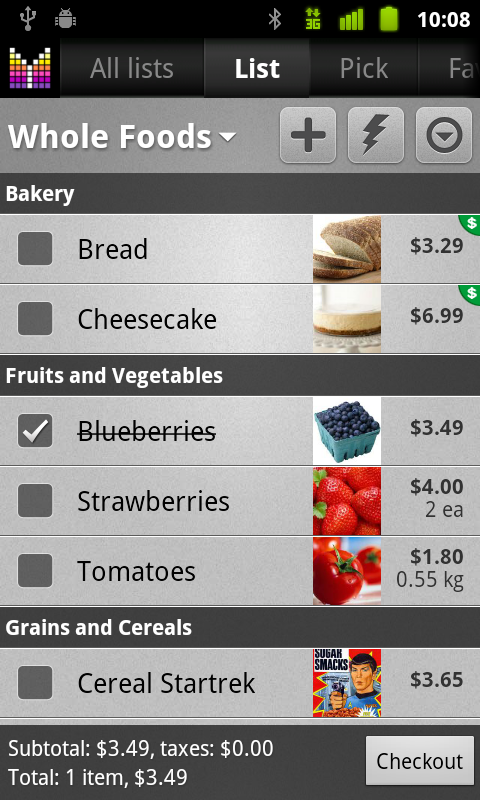 Yes, you can synchronize items in shared shopping lists using the Sync with cloud feature. Please see Sync with cloud User’s Guide for more details. When I delete items from a shopping list, it deletes it from the main list. I only want it to be removed from the shopping list as I decided not to purchase it this time. Is it possible to have it not be permanently removed? Kris, kindly note that you could permanently keep items on the Pick list if you add them under Menu –> Settings –> Pick list –> My picks. Otherwise, you will need to checkout the item so it will be kept on Pick list. 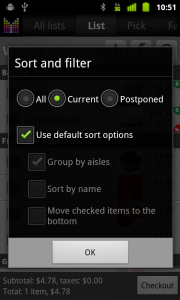 I would like to sort items by aisle not alphabeticly. Specificly how is this done? Thanks!!!! Hi Denise, thanks for your question. Kindly note that items are grouped by aisles by default. If they are not, then you probably need to turn off the Master list setting of your shopping list or enable “Group by aisles” option under Menu –> Settings –> Options. Please see this Frequently asked question. I sometimes add items which I will never buy again and them have to go into the database to delete three item. Would it be possible to add a setting to automatically delete something once checked out? This might be a repost – had a crash. If so, sorry. We may consider this improvement going forward. In the meantime you may want to try disabling “Automatic picks” option under Menu –> Settings –> Options. Once turned off, new items won’t be added to the product catalog in the app. Different stores have different prices for similar items, the same goes across multiple brands. Is there a way to set pricing differently for similar items such as “Farmers Market Peanut Butter” and “Whole Foods Peanut Butter” but keep it in the catalog just as “Peanut Butter”? Yes, just use the “Generic name” field and price compare feature will match items by this name. Please see Price compare User’s Guide for more details. Would it be possible to change the order of items in a specific list rather than just alphabetical ? Hi Bob, thanks for your question. There are two options at the moment: sort alphabetically or group by aisles (which can be manually sorted). We may consider change order of individual items going forward. Hi George, thanks for your question. 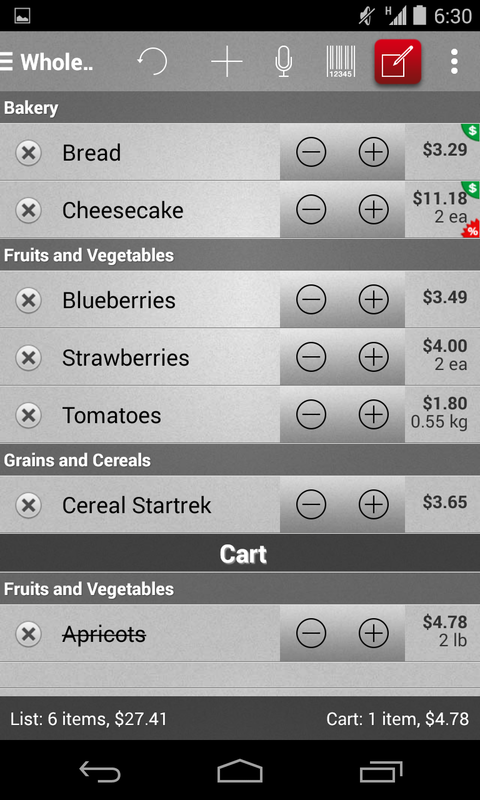 Yes, it is possible to create aisles (categories) within list. Please see Manage aisles User’s Guide for more details. As a follow up to my previous post about copying data over from the Lite version (1.0) to my new Full version (1.1). I tried clearing all data, and it did take me back to that original screen where I could answer yes or no. When I choose No .. it would just shut down the application. Hi Dave, thanks for your question. Kindly note that you need to update your Lite version to the latest update v1.1 before the Full 1.1 could transfer your existing data. I was wondering its it possible to add an item to multiple lists. Hi Ally, thanks for your question. Kindly note that it is possible to add items with the same name to multiple lists, however those will be different records which allows you to set different price and quantities if items are unlinked. Please see Linked and isolated changes for more details. I am just wondering if it is possible to change the names of the lists in this app? Possible how do I do it? Hi Amanda, thank you for your question. Yes, it is possible to change list names. Just go to “All lists” tab, tap (>) next to a list, then tap the Name field under Edit list tab. Please see Manage shopping lists User’s Guide for more details.